This customer in Poulsbo Washington called us because his friend had had a PermaBilt® building built. He’d seen his building, witnessed the quality first hand, and wanted nearly the same thing. 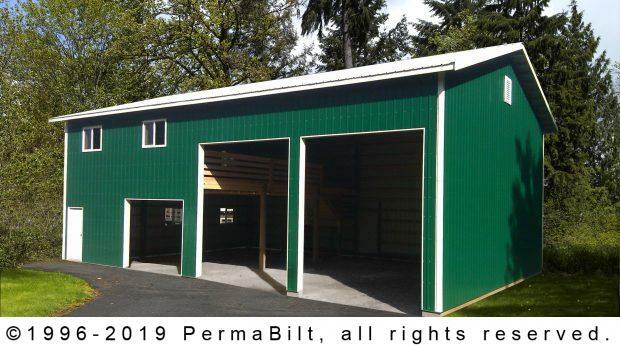 After meeting with his PermaBilt® Building Representative three times and ironing out all the accessories and details, he ended up going with a bit bigger metal garage and shop building than his friend’s. The customer purchased ceiling loaded trusses so that he was able to install sheet rock on the ceiling down the road and also had the posts engineered so that he could install a 50# loft down the road as well. The customer did an excellent job of sharing his future plans so that the building could be designed, engineered and constructed appropriately. It wasn’t too long that our customer moved in with his trucks and tools and got to work right away.